Running Crazy have taken thousands of runners over the years to compete in this event. With a great race, good class hotel accommodation close to the race start/finish, a fantastic after race party, and all at crazily cheap prices, you can see why it is becoming more and more popular. 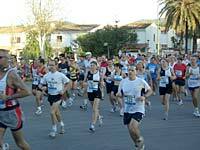 Running Crazy has been granted exclusive rights as the only UK Tour operator to offer the Calvia Marathon and Half Marathon from 2009 onwards. All english speaking applicants will be directed to Running Crazy who have a guaranteed entry of 400. A good class hotel on a half-board basis. The Half Marathon and 10K both start early evening. The course is relatively flat and scenic, taking in the tourist towns of Magaluf, Santa Ponsa and Palma Nova. Many runners have achieved PBs on this course, but the time limit for completion of the Half Marathon is 3 Hours. 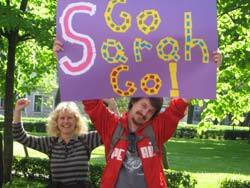 We know how important spectators and supporters are at these events. We provide a supporters package at no extra charge. We will advise where on the course are the most advantageous spectator positions, and how to get there easily and in time for the race. More often than not we will take you there and join you for a cup of coffee and have a few surprises planned whilst awaiting the first sight of the runners! All our hotels are comfortably furnished with TV and entertainment facilities - many have spas, pools and saunas too. ‘Running Crazy Ltd’ have secured good class hotel accommodation on a half board basis. We have also arranged an exclusive 'Running Crazy' changing room and toilets. This is ideal for kit security, aswell as showering and changing facilities. All rooms are comfortable, and the meals include breakfast, and a wide and varied choice of evening meals from 6-00pm to 9-00pm. - average monthly rainfall: 2.5"
Ensuring that your supporters, and friends & family are kept interested and occupied is an important consideration. There is free daily entertainment and activities in the hotel, together with an indoor swimming pool. The beach is just 200 metres away. There are ample bars, cafes and restaurants in the area. Don’t forget the After-Race Presentation, and of course the After Race Party, which goes on late in to the night. In addition there are optional sightseeing tours to Palma, Valdemossa for the tourist sights, and Puerto Portals for upmarket shopping or just relaxing by the luxury yachts in the Marina. This weekend offers a great opportunity for Clubs, or training partners to get together. Some Clubs already make this event their annual outing, and it is ideally suited, and combines a race, some fun, and shopping all in one. Travelling together may also be more convenient. There are discounts available for large groups (20+), but even a group of just 10, will qualify for an additional prize for the first or last to finish. If you are interested in taking part in this event, simply complete and return the Application Form. Further details will be sent by return of E-Mail including travel tips, a full price list, and payment arrangements. This was our first trip with Running Crazy and I wouldn't hesitate to book with them again or to recommend them to my fellow runners. It was so well organised with a real family atmosphere, we felt very well looked after by all. The race was without a doubt worth doing but I'm still confused as to how everyone appeared to have so much energy at the 'after race party' (which by the way was a good one). Have recently returned from completing the Calvia Marathon in Majorca with Running Crazy.....and can say that I thoroughly enjoyed the weekend. Nothing was too much trouble for Malcolm and his colleagues and the cost was extremely reasonable. The organisation of the weekend was excellent and the Marathon itself was very well marshalled. I was particularly impressed at Malcolm's ability to organise such fine weather for us in Majorca! 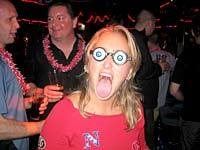 I would certainly recommend Running Crazy to anyone considering running a marathon overseas. Best wishes for the future, Malcolm! This was our first trip with Running Crazy and I wouldn't hesitate to book with them again or to recommend them to my fellow runners. It was so well organised with a real family atmosphere, we felt very well looked after by all. The race was without a doubt worth doing but I'm still confused as to how everyone appeared to have so much energy at the 'after race party' (which by the way was a good one). Looking forward to our next trip. Well done Running Crazy. 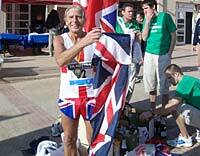 Just returned from Majorca after the marathon. Thank you Malcolm, Gerry and Richard for making the weekend so enjoyable and easy to enjoy!! As always the organization was spot on, the hotel ideal and the company of all the other runners made for a super relaxing time. My third trip with Running Crazy and I am already looking forward to the next one! Thanks again!! This was my first trip with Running Crazy. I was travelling on my own for the first time but I needn't have worried...Richard was there to meet me at the airport and from then on I never felt alone! Thank you Malcolm for looking after me that first day and introducing me to Liz and thanks to all of you for such a great weekend. I have told my friends all about you and will definitely be booking up with you again sometime next year. Many thanks for a very enjoyable Calvia, Majorca race weekend. All four of us Handsworth Roadhogs (Sheffield) enjoyed the event. For three of us it was our first time with 'Running Crazy' - we were all impressed with the event organisation and hotel accommodation. It has certainly given us the appetite to organise another weekend away with 'Running Crazy' next year and hopefully entice a greater number of our club runners to join us. Again many thanks to Gerry, Helen and Malcolm. Malcolm - I just wanted to thank you for making one of the most memorable experiences - my first Marathon - also one of the best ones. You really made a difference. I am still buzzing from the Calvia, Majorca race and I am looking forward to the next one! Thanks again for being so helpful and friendly. A great weekend organised by the guys at Running Crazy. For the risk of using too many superlatives, why would you consider going abroad without Malcolm and the boys? A fun weekend and a service that you wouldn't get if you booked independently. After race party awesome and, yet again, met some great people. See you in Prague! Thank you for a wonderful weekend Malcolm, Helen and Gerry. Josh and I really enjoyed ourselves. You did a wonderful job and everything was very well organised.....thank you once again. Malcolm, we really appreciate your very caring attitude that shone through for the whole of the weekend...and even beyond in offering to help locate our lost shoe! We really enjoyed supporting the runners and I feel that our applause and cheers at the 9 & 18 mile marks, plus at the Start and Finish was really appreciated by the runners. Please keep us posted for any future runs where we could offer some support. I want to thank you for a great weekend - all of us at Handsworth Roadhogs had a really good time. I thoroughly enjoyed the whole experience. The hotel was lovely. I was very impressed with the food and particularly because I am a Vegan - there was plenty of choice even soy milk at breakfast! 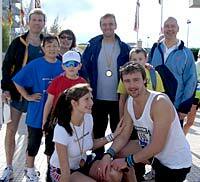 The staff were very friendly and helpful and of course the 'Running Crazy' team were brilliant. I enjoyed the race (despite the wet weather). I have run a few half marathons but have never witnessed the finish of a marathon before. I was surprised at how emotional I found it and was full of admiration for all the finishers. I may even be inspired enough to do one myself one day! The icing on the cake was me winning a trophy - great! 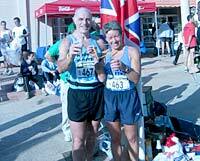 This was my first overseas race and I would certainly recommend 'Running Crazy' to fellow runners. Thank you again for a great weekend in Majorca. Please pass on my thanks to your team. Hi Malcolm. 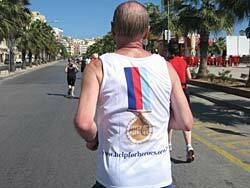 A Big "thank you" to you and your helpers for the Palma Marathon, Half Marathon & 10KM trip from all our group. Excellent organisation, lovely hotel - we had a great few days in Majorca and really enjoyed ourselves. It was good to bring a few trophies home!! Thanks for all your hard work and attention to detail - very much appreciated.